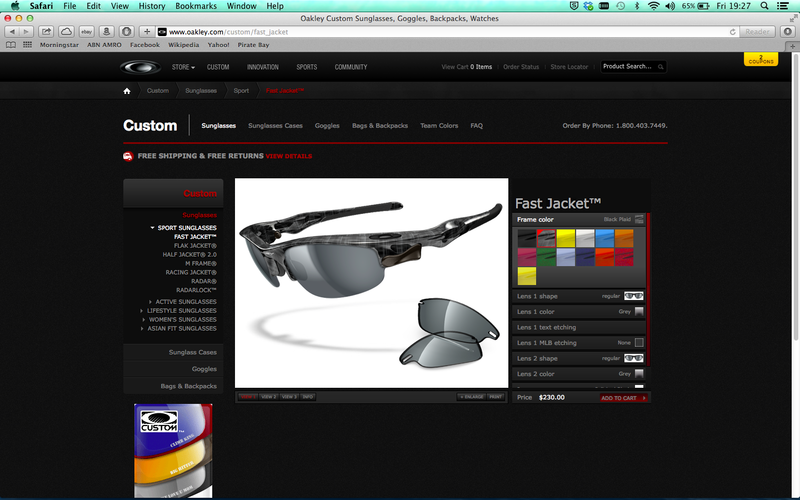 Oakley is a brand specialized in producing high quality sunglasses. Oakley’s products are mainly used by extreme sports athletes. Their products outperform all other brands when it comes to design, lenses, comfort and their overall functionality, considering they are used in many extreme sports. Oakley also promotes many outdoor Olympic sports. When some one is wearing Oakley sunglasses, one can assume that he or she is a very active individual. How ever, Oakley has recently started branching out, offering more designs for casual occasions. 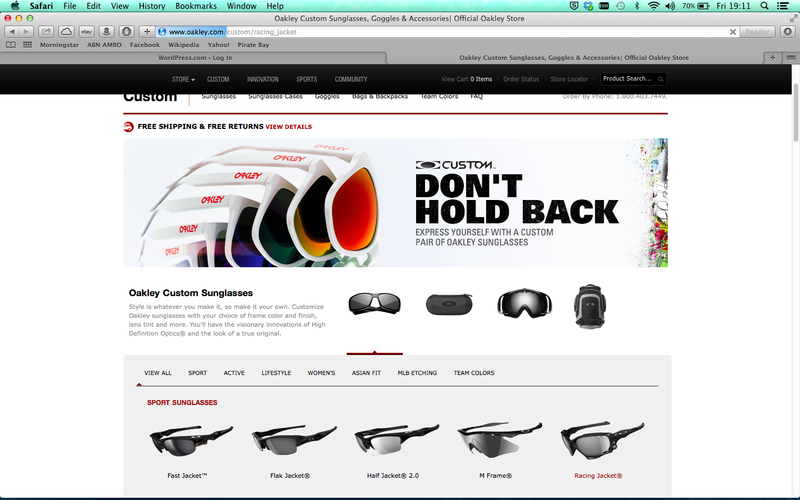 With this change in strategy Oakley offers the possibility to consumers to design their own sunglasses. It also gives the option for a consumer to design their own case for the custom sunglasses, but also skiing goggles and bags. Again a really important aspect that allows brands to offer such products or services is technology. Their online website is great, but the best part are the images. The high quality of the images when designing your own set of glasses is amazing. When a user changes the frame design or chooses for another color, the image is very sharp and realistic. We see how important technology and digitalization are in these processes. The types of sunglasses vary between; sport, active, lifestyle, women, Asian fit, MLB etching and teams colors. Within every theme there are several designs one can pick from. Once a design is chosen a consumer can decide from several attributes such as: frame, frame color, lens, lens color, lens shape, lens text etching, lens MLB etching, icons and ear socks. When we consider individualism and mass customization this is a perfect example. Consumers have a large variety of attributes to choose from. This allows them to maximize their utility by designing a product that meets their exact requirements. Also, consumers are guaranteed a unique product, as no one else will have the same pair of glasses. As mentioned above this particular product requires some knowledge about glasses. Oakley especially positions themselves as technologically advanced, because their product needs to function at times under quite demanding conditions. However an average consumer that simply wants to design his or her own set of glasses may not have all that information or knowledge available. Unfortunately on the current site, there aren’t any explanations of what more technical attributes do. Another aspect why this is important is that consumers want to know what they are buying. When considering this case if an individual knows, or is aided in understanding that for e.g. a certain type of lens is more suitable for dusty environments he or she may be willing to spend more to purchase it, if this is what they require. The key point here is that the consumer needs this information, such that they can make the best decisions, and maximize utility. Lastly Oakley has a very active and present community. Consumers can share experiences about their sunglasses. Also consumers, who buy these products to have technologically advanced glasses for their sport, get to share experiences of their products when performing their activities. Oakley Sunglasses are incredible for blocking glare from your sun. These sun glasses project our eyes from ultraviolet radiation and makes your eyes more comfortable and healthy.